Ibanez Collectors World: WHAT do ya think of the Hagstrom SWEDE?? It's definitely a collectors brand. Our former bass player had a Hagstrom bass. Nice vintage instruments. And very wanted among Skandinavian collectors of course. Jazzz, I don't know *bout the Hagstr�m situation in the U.S. of A., mainly because I am here in Scandinavia.. But I know they were imported there, how many, I don't know. Now that you mentioned Denny Laine.. take a look at the AR 5000-thread, there is a pict of another Denny Laine- favourite, a VA-900 Vantage.. 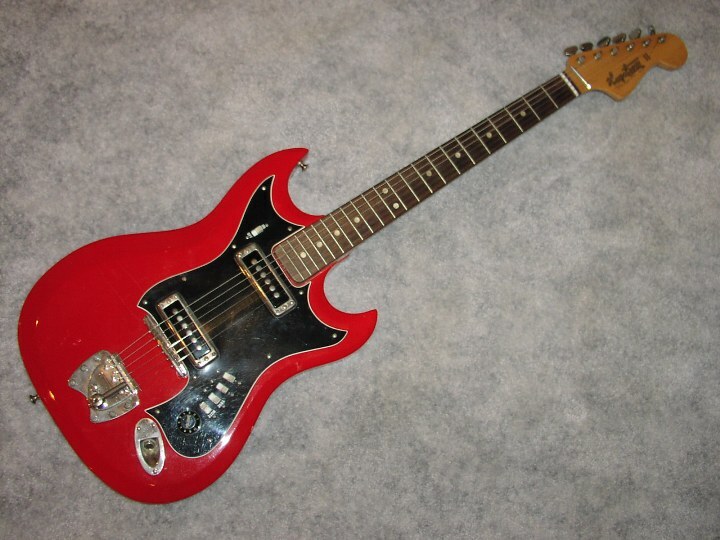 I have an old Hagstrom that I found quite interesting. Good quality, very fast neck. Pups are weak though. Jazzz, old vintage Swedes and longer scale Super Swedes go for 1100-1500 USD about.. Of course depending on condition etc.. I have used one 70:s swede in the studio for a couple of tracks and it�s very heavy. Heavier than my �79 stratocaster and that one heart my back after a rehearse! But it sounds real god, and the sustain is for ever. I would say that the quality and sound is on Ibanez level but the playability is not. I don�t know if the pups is original in this one, but as i said it sounds real god. Here in Sweden whe are kind of proud over the vintage Hagstr�ms and Levins, it�s a pitty they don�t survived the competition back in the 70:s. Now, they are made in China and Korea and that is not the same!! I think the first reissues/prototypes or whatever you call them was Made in Sweden. I don�t know why the Hagstr�m family agreed to outsource the manufacturing to China but that is the way it works those days. The labour in China is for free, and they are skilled but the tradition and brand history fades away!! Yes, i�m a Swedish guy but the vintage ibanezes guitars and fenders have cought me in a trap, not even the old Swedish guitars atract me as the AR:s and the Fenders do! But the Hagstr�ms are realy good guitars! No doubt. Thank you for supporting Ibanez Collectors Forum. Please help your favorite Ibanez guitar site as we endeavor to bring you the latest information about Ibanez custom vintage electric and acoustic guitars. Here you can discuss ibanez, guitars, basses, acoustics, acoustic, mandolins, electric guitar, electric bass, amplifiers, effect pedals, tuners, picks, pickups.